The fees stated in (i ), (ii) and (iii) covers two persons, EC $10.00 is required annually for each additional person who will use the account.Â ALL names MUST be given or entered into the client information. One person will be responsible for all charges and notices are sent to one email address. Upon registration, each account will be assigned a unique customer number which must be includedÂ in the shipping address to be provided. The United States Postal Service (USPS) requires that their PS Form 1583 â€œApplication for Delivery of mail through Agentâ€� be completed in order to have your item exported from the United States of America.Â Â Â Â Â Â Applicants would be required to present two forms of identification when registering for this service; Passport and Driverâ€™s License are prefered. Packages are insured for 150% of their invoice value. An Insurance waiver notice must be completed if customer does not wish to have items insured. All customers will be notified by Ezone office in Miami by email when a package has been received in Miami. All customers will be notified by the Anguilla Post Office by email after the package has been received on Anguilla, processed and ready for pick up. Information regarding number of items received, freight and insurance cost will also be included in the email notification sent from the Anguilla Post Office. 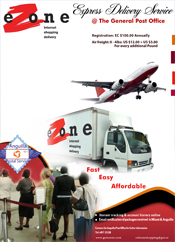 In accordance with the United States of America â€œViolators of Federal Hazardous Materials Regulations (49 CFR Parts 171-180)â€�Â all Packages received at EzoneÂ Miami will be opened to determine if they conform to exporting requirements and do not contain hazardous material.Â Items identified as not acceptable to be shipped by air will be held and addressee contacted to ascertain how the item should be handled. Many more interesting features and information not indicated above are available with this new service. Pressure containers: Spray cans, butane fuel, scuba tanks, propane tanks, CO2Â cartridges,Â Â Â Â Â Â Â self-inflating rafts, etc. Many common items used everyday in the home or workplace may seemÂ harmless, however, when transported by air, they can be very dangerous.Â In flight, variations in temperature and pressure can cause items to leak, generate toxic fumes or start a fire.